These are the questions GGAS Youth Programs Manager, Clayton Alexander, most often hears when his Eco-Education students first see the unending line of trash that appears along the San Francisco Bay shoreline as the winter rains flush garbage and debris through the watershed. This line of inquiry is full of opportunity for Clay. 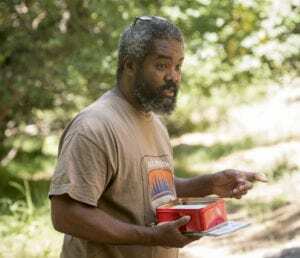 It allows him to take his students on a journey of exploration that starts with their neighborhood storm drains, travels along creek beds, through wetlands, and ultimately ends at the Pacific Ocean. 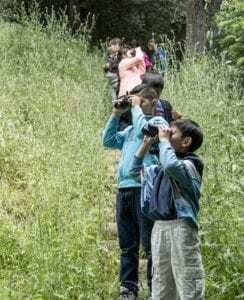 Over nearly two decades, Golden Gate Audubon has inspired close to 20,000 young people to take better care of their local watershed through Eco-Education and the program continues to win hearts, minds, and awards. Eco-Education was the recent recipient of the Alameda Watershed Confluence Award for Best Youth Program. It is a past recipient of the Governor’s Environmental and Economic Leadership (GEELA) Award and the Outstanding Service Award from the North American Association for Environmental Education (NAAEE). 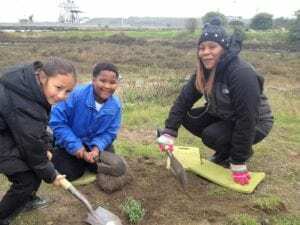 But, most importantly, the restoration focus of the program has helped transform Pier 94 in San Francisco, Arrowhead Marsh in Oakland, and other sites around the Bay Area, into vital and diverse wildlife habitats. 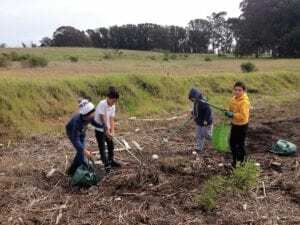 The US Geological Survey acknowledged Eco­-Education participants for restoring upland habitat for the endangered Ridgway’s Rail at the Martin Luther King, Jr. Regional Shoreline. 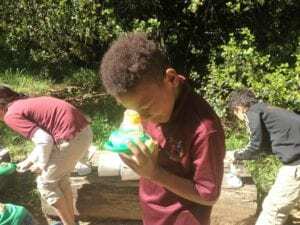 In the Bay Area, despite their proximity to the San Francisco Bay and the Pacific Ocean, many children from under-resourced neighborhoods and school districts in Oakland, Richmond, and San Francisco, have little contact or awareness of the natural world around them. These children often lack opportunity to encounter the ecosystems and biodiversity within their local creek, wetland and ocean habitats. Through Eco-Education they begin to understand the positive role they can play in helping wildlife. GGAS’s multi-dimensional Eco-Education Program empowers children and their family members to explore nature with joy and to cherish coastal habitats and the unique cohort of wildlife their own local watershed supports. Providing young children from under-served areas with the education, exposure and information about the watershed and coastal habitats inspires them to become active environmental stewards and to continue to apply those lessons in the future. The legacy of the program builds exponentially as each student brings the lessons they learn home to their family, community and, eventually, their own children. The cascading effects of good stewardship become truly multi-generational. How do we do it? During the year, Clay and a small group of committed volunteers, take approximately 500 public schoolchildren from Title 1 schools on a yearlong exploration. Using Next Generation Science standards-based lessons, the students learn about their local watershed, and practice science and stewardship activities. Students are empowered through discovery activities, knowledge-building lessons, and hands-on stewardship opportunities. Activities include: learning to use optics, including binoculars and field microscopes; the temporary collection of organisms for study (safely replacing them afterwards); learning how to use field guides and field identifiers for each habitat; practicing detailed scientific observation and reporting. Additionally, they conduct salinity tests along the watershed, practice distinguishing species in the field using binoculars and spotting scopes, and restore habitat by planting appropriate native seedlings and removing trash on their field trips, including on the culminating ocean field trip. Leslie Weir is the Development and Communications Manager at Golden Gate Audubon.